Getting a pay raise while sitting on the couch? Sign me up! Thanks JP Morgan for the dividend increase! Yesterday the Board of Directors at JP Morgan Chase (JPM) approved another increase to their quarterly dividend. The dividend was increased from $0.48 to $0.50. That's a 4.2% increase to their dividend payment. Assuming the dividend is maintained at this level fro the remainder of 2017, this year will be 7 consecutive years of dividend growth for JP Morgan giving them the title of Dividend Challenger. Shares currently yield 2.29% based on the new dividend payout. Since I own 23.093 shares of JP Morgan in my Roth IRA this raise increased my forward 12-month dividends by $1.85. This is the 6th consecutive year of dividend increases that I've received from JP Morgan since initiating a position in late 2011. Cumulatively my dividends from JP Morgan have exactly doubled from $0.25 to $0.50 from dividend growth alone! According to USInflationCalculator the total rate of inflation over the same period is just 8.3%. 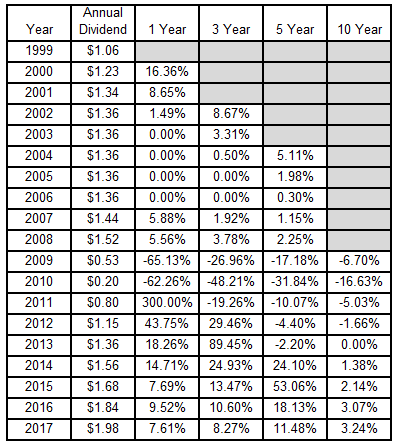 JP Morgan doesn't have the most appealing dividend history that I've ever seen, but it looks stellar for the time that I've owned it. Chase's dividend record has periods of no growth, then cuts during the financial crisis and then a return to growth ever since. Annual dividend payouts previously peaked in 2008 right before the financial crisis and investors then didn't see a higher annual dividend payout until 2014. However, with investing timing is everything and from my perspective the dividend growth has been fantastic. 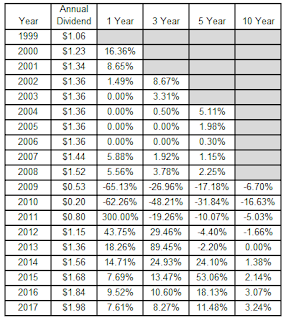 I think it's pretty remarkable considering all that the financial industry has been through in the last decade that JP Morgan has still managed positive 10 year dividend growth rates for the last 4 years including 2017. *2017's annual dividend assumes 2 additional payments at the $0.50 per share per quarter rate. My forward dividends increased by $1.85 with me doing nothing. That's right, absolutely nothing to contribute to their operations. Based on my portfolio's current yield of 1.94% this raise is like I invested an extra $95 in capital. Except that I didn't! One of the companies I own just decided to send more cash my way. Thus far in 2017 I've received 12 dividend increases from 11 companies held in my FI Portfolio increasing my forward 12-month dividends by $65.37. I've also received 2 increases from companies held in my Roth IRA, including JP Morgan, increasing my forward 12-month dividends by $4.13. My FI Portfolio's forward-12 month dividends increased to $5,616.31. Including my Loyal3 portfolio's forward dividends of $69.25 brings my total taxable accounts dividends to $5,685.56. My Roth IRA's forward 12-month dividends increased to $285.78. Do you own shares of JP Morgan Chase? Or have you sworn off investing in big banks? Good info! I made some investing mistakes the past few years...getting far too defensive with precious metals/real estate (did OK with real estate - metals haven't done well at all the last few years)and missing the big stock market run. 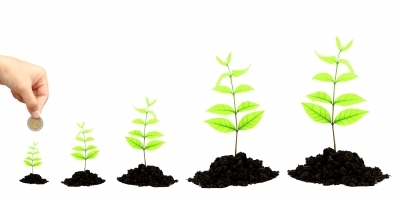 Slowly moving back into dividend growth investing. I've started branching out a bit from my DGI bread and butter mainly with options although also with some options on the gold miner ETFs. It's definitely more entertaining/fun than DGI. Time will tell if it's profitable though.